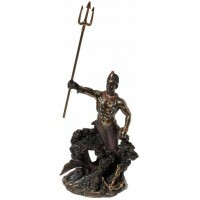 Oya is the orisha of tempest and love clearing the path for new life here as a stunning bronze resin statue. Oya embodies the gentlest breeze to the raging cyclone. With her powers and machete she clears the path for new life and watches over the newly dead as they transit to the underworld. Her energy reminds me of the Tower card in Tarot - destruction of what must go in order to bring in something new and better. Item Number: UI-WU76793A4 | Approximate Size (Inches): 4.50 wide x 3.00 deep x 9.50 high | Approximate Shipping Weight: 3.00 lbs.